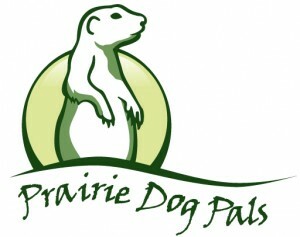 Prairie Dogs and Nuclear Waste: Who would have known! Rodney Baltzer, President of WCS, explained to the NY Times that the company has dug a huge pit in Andrews Country, Texas, with other planned to be dug over the next few years, into which a base layer of nearly waterproof clay has been set. Then a layer of concrete was poured on top, reinforced with steel, and then three layers of plastic. The low-level nuclear waste is loaded into large concrete containers and then placed in the pit, which once full will then be covered by a 40-foot thick cap of concrete, clay, and finally a special cap to prevent prairie dogs from burrowing into the area. Owls react to alarm calls from prairie dogs. 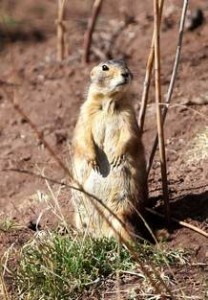 (ISNS) — The term “keystone species” was made for prairie dogs. These charismatic critters build vast underground towns across the plains, creating housing for themselves and many other animals. One of the squatters is the Western burrowing owl, a tiny insectivore that makes its home on the outskirts of prairie dog colonies. New research suggests that the owls don’t just gain a free home from the prairie dogs, but they also eavesdrop on the prairie dogs’ sophisticated alarm calls, which scientists have described as a rudimentary form of grammar. The owls, less than a foot high, sneak tips about lurking predators from their highly vocal housemates, according to a study in next month’s Ethology. Prairie dogs may not be the only critters burrowed into the grasslands of western Nebraska. The swift fox also calls the area home. 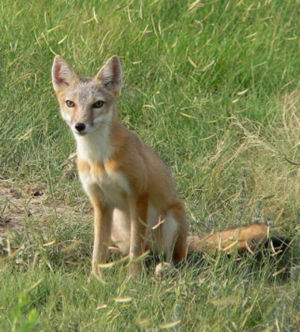 The native swift fox is on the Nebraska endangered and threatened species list. For that reason, the Nebraska Department of Roads and Marc Albrecht, associate professor of biology at the University of Nebraska at Kearney, will collect data on the foxes in the spring and summer of 2014 along the corridor of the Heartland Expressway.